Here's a posting about a free self-publishing class you may want to check out if you've got writing lying around and don't know what to do with it. The class sounds fun and informative, and if you're not au fait with how you self-pub, the class is a cheap (free) way to learn. 2. Someone's stealing my work! Use Copyscape, and sign up for Google Alerts using identifiable snippets from your work. Your rights to your work are protected by the DMCA. If you find a site that's publishing your material without your permission, take action -- not only can you get their site taken down, you can also get them blacklisted. 3. Eliminate writer's block permanently. 5. Web-based software: Collaborate with others with a Writeboard. I use Basecamp for working with clients and writing students. Aligns well with my use your brain and body post. If you’ve been reading this blog for a while, you know I’m a software junkie. My own software du jour is Dreamweaver, it’s indispensable for Web publishers. When you write, you use words. However, thinking in words when you write is limiting because you’re not using all of your brain power. Your right brain thinks in images -- it’s non-verbal, and your memory is recalled via images, emotions, and body sensations. When I coach writers, I encourage them to go beyond words. How do you go beyond words? Start by paying more attention to your current emotion(s) and your body. First ask yourself what your current emotion is -- and it doesn’t matter what it is. Is it boredom, excitement, irritation? Next try to locate the emotion in your body. If you’ve never done this before, this seems odd. Try. Where in your body do you feel the emotion: is it heaviness in your chest? Tightness in your throat? Fizziness in your head? Whatever sensation you feel in your body, stay with it for a few moments, and wait. Just feel. As the physical sensation/ emotion dissipates (emotion moves), you’ll get an “idea” which is not an idea -- it’s an impression. Write. You may see an image. Write the image. This process takes longer to describe than to do. When you’re in “flow” you’re doing it unconsciously -- you’re plugging into your entire body/ brain complex. If we accept the idea that peptides and other informational substances are the biochemicals of emotion, their distribution throughout the body's nerves has all kinds of significance. Sigmund Freud would be delighted, because the idea that the body, in its totality, is also the unconscious mind, would be the molecular confirmation of his theories. Body and mind are simultaneous. I like to speculate that the mind is the flow of information as it moves among the cells, organs, and systems of the body. The mind, as we experience it, is immaterial, yet it has a physical substate that is both the body and the brain. I’m a chocaholic, so I’ve got a chocolate habit. I’ve also got a book habit. Plant me anywhere, and I’ll look for the nearest book shop. Of course, my biggest habit is my Writing Habit. Three times today, do a timed writing of five minutes. Just write wherever you happen to be. Start by describing three things you can see, and go on from there. Do the five-minute, three-times-a-day timed writings for two weeks. This will help you to integrate writing into your day so that writing is just something you do; it'll go a long way to developing your Writing Habit. During those two weeks, watch your own reactions. Your intuition is your creativity, and your intuition helps you in all your writing. Become aware of glimmers of ideas and feelings. What excites you? What time of the day do you most feel like writing? At the end of three weeks, you will have developed a Writing Habit. Copywriting (writing for business) is a great career for a writer, because it’s customizable. You can work as many hours or as few hours as you please. If you’re working on a project of your own, such as writing a book, or are on a long-term contract for a client, you can cut down on the new clients you accept and can work fewer hours. You can also ramp up your career at any time to attract new clients. The Internet makes getting new clients a breeze. You can live anywhere, and get as many clients as you happen to want. No meet and greets, no presentations -- just get the work and do the work. That said, I know that getting clients is often a challenge for both new and established copywriters who aren’t sure how to build a thriving business. Therefore, I’m developing a one-on-one personal coaching program, using basecamp, for copywriters on how to build their business. I’ll be announcing the program shortly. If you love to write, you can turn your love of words into a full-time, satisfying career by writing for business. Business writers (often called copywriters) write for others. They write advertising, Web content, product manuals, books -- anything and everything that a business wants. 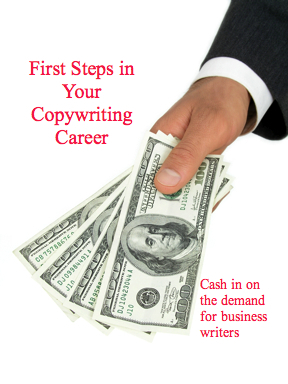 Find out more in my instantly downloadable writing manual “First Steps in Your Copywriting Career: cash in on the demand for business writers”. Like all performers, writers get stage fright -- but we call it “page” fright. * Rehearse. Do lots of pre-writing work, like clustering and free writing to build up the raw material for your mystery novel, or whatever it is that you’re writing. The rehearsal phase can include rough drafts (I call them flash drafts) -- all the dialogue in a chapter for example, or all the settings, or character journals for all the main characters. Modeling and rehearsing help you to write ANYTHING. Don’t skimp on the rehearsal phase. It’s a lot of fun, and low pressure. If you hate marketing, you're crippling yourself as a writer. Here's my new blog -- developed to help you to love marketing. I love my Mac and use freeware apps every day. Where do I find this amazing stuff? On MacFreeware.com, often. Nvu: free HTML editor -- great for fast HTML pages. Word associating is a fun technique that you can use anytime to make your writing more lively, and to give yourself fresh areas to explore. You can use word associations to help you write ANYTHING. When a piece of writing seems boring, consider using word associations to spark it up. When you select words and write a list of associations, you're maximizing your brain power. Pick a file on your computer – this can be a letter, an email message, a story, an article --- anything. Choose any three words you've used in the document, and copy them to the end of the file. Now free-associate. I like to do this on paper, but it's up to you how you do it. Write 50 to 100 words of free associations. You can list the words, or use clusters. You can free associate using tools like IdeaFisher, too. Sometime before you get to the end of this process, you'll get an urge to write. Obey the urge. Write at least 100 words of your inspiration. Note: your inspiration may seem unrelated to the themes that you were exploring in your word associations. That's fine --- it's part of the magic of this process. When you've finished writing your inspiration --- which may be as short as a couple of sentences or several pages long --- copy this into the original document. Want to write more than you write now? If you're not writing much, it's not because you're lazy, or you lack motivation, or you don't have time management skills. It's because you lack a METHOD. I discuss My How-To-Write-No-Matter-What Process in Writing for Online Cash -- the ebook writing manual is packed with tips like this to help you to WRITE. Wood Allen said 90% of acting was just showing up. It's true about writing too. But what if you show up at the computer, and just sit there staring at the computer screen? On those days, you need a mechanical process to get you writing which doesn't take thought, inspiration, or prayer, and which you can use for both fiction and non-fiction. I developed this process while writing copy for clients, and was delighted to find that it works for all kinds of writing, not just for copy. The process tickles your right brain/ subconscious into creative mode and is a stress-free way to get your writing done. Try the process. It works, because it's mechanical. You don't need to wait until you're "inspired" and you can fit the steps in whenever you have a spare five minutes. I do a lot of this work on my Palm handheld when I'm out and about -- the process is very portable. Try it. Please let me know how it works for you in the Comments to this post. Increasingly, the new, new thing in media is getting paid for the homemade. Reflecting the surge in the popularity of user-created material, both online and traditional media companies are opening their wallets to make sure that the best of it finds its way onto their television shows and Web sites.